This month they're celebrating with up to $55 freebies and several match bonuses. A new slot game with sticky expanding wilds and free cash wins is expected to launch during this month’s birthday celebrations. This weekend, all players can claim a $17 birthday freebie using bonus code “BDAYFREEBIE”. VIP players will get an up to $55 freebie using this code. Deposit bonuses up to 200% are also available this weekend and there will be more announced by email and on Facebook through the month. Every Tuesday during this month of birthday celebrations, claim a 70% casino bonus using bonus code “MATCH70”. This bonus, which has a wagering requirement of only 12X, can be claimed twice. Next week, we'll get bonus codes by email that we can use next weekend to get as much as 80% extra (up to $300) on four deposits. 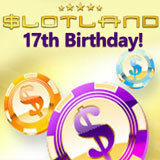 Slotland creates all of its own one-of-a-kind online slots. That's why you don't see games like Gods of Egypt anywhere else! Anyway, they're putting the final touches on the next new game -- a hunting-theme slot with a sticky expanding wild. It will also have a symbol replacement feature that will change regular symbols into Double Wilds, boosting chances of winning. The unique casino is a pioneer in online and mobile casino games and continues to raise the bar in game design and customer service. Slotland has 35 real money online slot games, all available only at Slotland. They’re all compatible with iPhones and other iOS devices as well as Android smartphones and tablets. Firstly Congrats!! And the 17th Birthday Bonuses is really very amazing. Everyone should avail this offer. Thank You! !